In this sculpture, a large brown and small black bear sit back to back in quiet thought. Although in nature these two animals are enemies, Fredericks portrays the two in a gentle humanistic way, stressing tolerance. Notice the differences in the bears’ ears and noses. Also if you look closely at the small bear’s knees you will notice a tear drop sculpting style, known as one of Fredericks’ trademarks. Carson Pirie Scott & Company originally commissioned Two Bears for Lincoln Square, a shopping center in Urbana, Illinois. 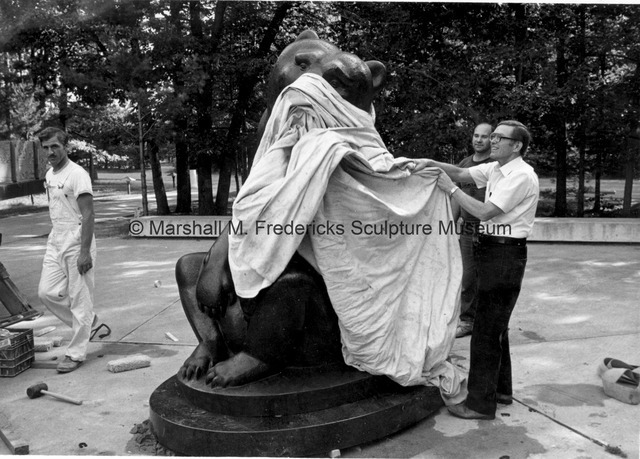 “"Two Bears" is unveiled at Interlochen Center for the Arts,” Marshall M. Fredericks Sculpture Museum, accessed April 24, 2019, http://omeka.svsu.edu/items/show/3632.